The ultimate primer for Concrete. Paint lasts, caulks and sealers stick! When you want a paint, coating or sealant to stick to concrete and stay stuck, use Damp Concrete Primer first. Old, dirty or oil-contaminated concrete should be treated first with Smith’s Permanent Concrete Sealer. It is an odour-free zero-V.O.C. waterborne concentrate that glues any topcoat to wet or dry concrete. 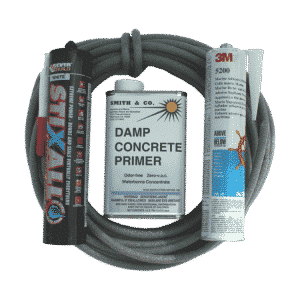 Damp Concrete Primer is intended to be used as an adhesion-promoting primer for a wide variety of adhesives, sealants and coatings on damp or dry concrete. 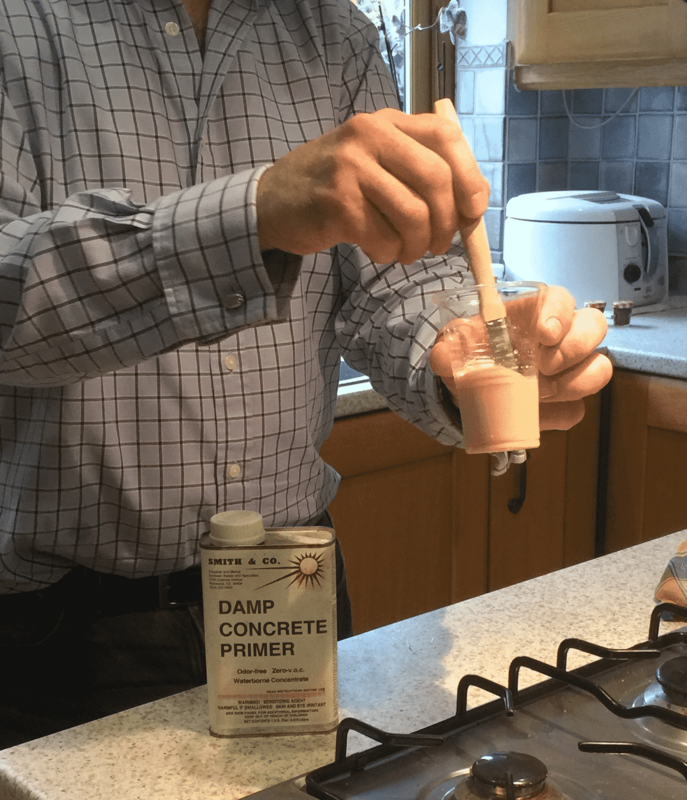 Damp Concrete Primer (DCP™) self-emulsifies by mixing with water. This makes it more economical than two-component epoxy primers for applying any maintenance or protective coating to concrete. Since it contains no solvents, it is legal to apply anywhere on any structure . You save money as well as gaining better coating reliability. As a contractor when your work sticks and lasts and the customer sees your work stays stuck year after year, you get more word-of-mouth referral business. In order to use Damp Concrete Primer, add two parts by volume tap water to one part by volume of DCP. 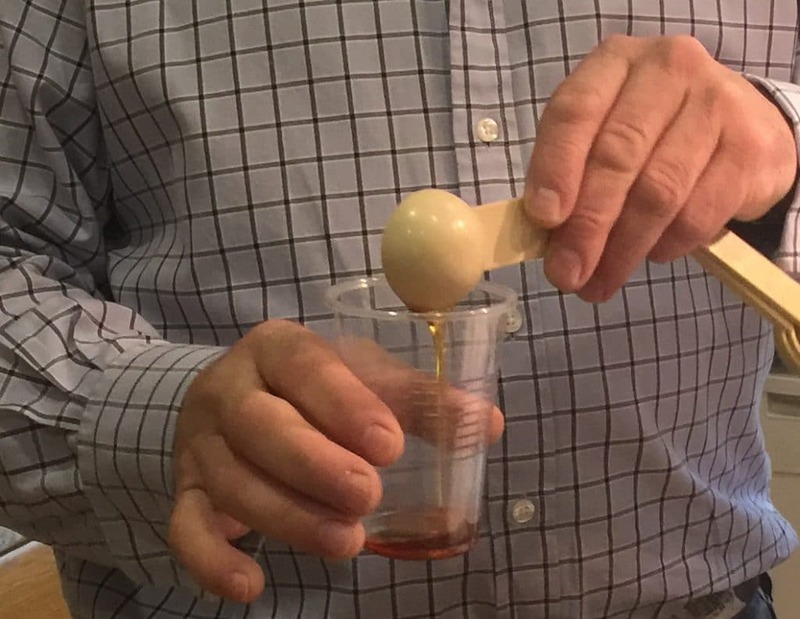 Mix well, and observe that the mixture becomes an opaque creamy tan coloured liquid. The mixture may be applied by the same kind of rollers or brushes as are used for latex paints. The adhesion-promoting film is effective in a thickness of only a few thousandths of an inch (a hundred microns or less). This film is distributed over a surface by brush, spray or roller application of the emulsion onto the cement surface. Natural evaporation of the water will leave a thin film of the DCP resin itself directly wetting the cement surface. One litre (One US Quart) of concentrate is adequate for 40 square metres (400 square feet) of average concrete. On more porous concrete, more may soak in and the coverage may be less. A pint (475ml) of DCP mixed with two pints (950ml or 0.95l) of water is to be applied over twenty square metres (two hundred square feet) or less as above. Use what you mix within an hour. Once applied to a concrete surface, allow to dry until the appearance changes from a creamy tan liquid to a clear, dark amber oily film. Further drying until the film is slightly sticky is ideal. This typically takes one to three hours. Then apply any topcoat according to the manufacturer’s instructions. If you see the Damp Concrete Primer turning yellow as it dries, this indicates there was excessive water in that area of the concrete. If the concrete is really wet, instead of merely damp, this may happen. Immediately apply more DCP to disperse the yellow granular material. A normal appearance of properly primed concrete will be a transparent amber film. Besides forming chemical bonds with properly prepared concrete, the Damp Concrete Primer will form chemical bonds with freshly applied isocyanate-cured polyurethane paints or polyurethane elastomeric coatings or amine-cured epoxy paints or epoxy coatings. Then they stick and stay stuck . It chemically bonds to any topcoat we know of , creating the strongest, most water-resistant chemical bond possible. 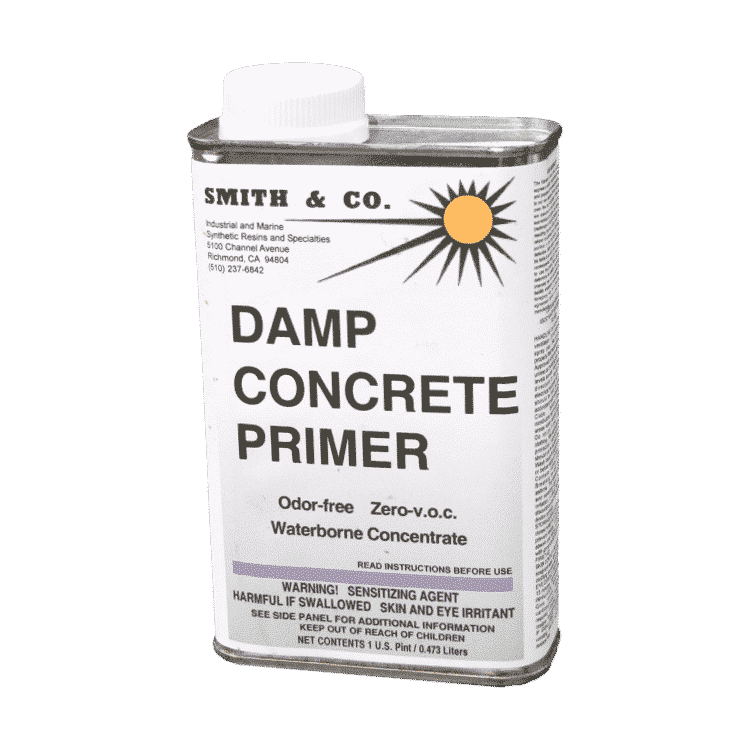 Damp Concrete Primer is designed to stick a final coating, a painted or anti skid surface perhaps, permanently to concrete. It may be applied to either dry or damp concrete, after sealing with Permanent Concrete Sealer if required. Damp Concrete Primer can be used to ensure caulks adhere properly to rendered or other concrete surfaces. If you wish to prime wood, you should be using Smiths Clear Penetrating Epoxy Sealer (CPES). Damp Concrete Primer was introduced in 1992 as a component of a kit for the repair of leaking bathroom floor drains in Sweden. This technology has since been certified by the Swedish agency that regulates such installations, and to date in excess of six thousand floor drains in Sweden have been repaired by our licensees, with no failures. Damp Concrete Primer was introduced to the U. S. market in 1999, and they have had no failures in any application. It is now available here.